Friendship between Peppa and Suzy has been interpreted as plastic or fake by some Chinese netizens. Screen capture from a Peppa Pig derivative video. The latest addition to China's extensive list of censored cultural products and programs is the objectively adorable cartoon pig Peppa. 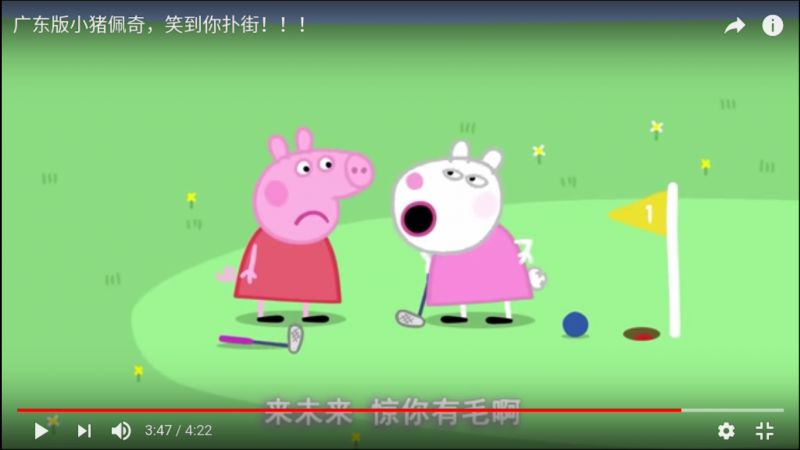 The popular video platform Douyin recently put  Peppa Pig, a children's cartoon megastar, on its censorship list. The company removed more than 30,000 videos of the cheerful pink character and made the term “Peppa Pig” unsearchable on its website. What could the precocious pink pig possible have done to land herself on the censorship list? Has she disrupted China's Harmonious Society ? In April 2018, commentary on state and party media outlets Xinhua  and People’s Daily  hinted that the ban might be imminent. One commentator from party-affiliated news outlets criticized a certain subculture that makes an association between Peppa Pig and “Shehuiren”, a term that is literally translated as “man in the society” and refers to hooligans with a triad  background. In China, a triad is commonly known as a branch of any one of a number of trans-national organized crime syndicates. The more Peppa Pig is associated with Shehuiren, the more people worried that Peppa Pig would be destroyed. Quite a number of primary and junior high school students are showing off with their Peppa Pig accessories. Some are even taking advantage of the subculture by selling counterfeit products to make a profit. We should be wary of these kinds of subcultures. We should not let Peppa Pig ruin kids’ childhoods, flout the rules and disregard the bottom line. The state-run China Central Television officially imported  the Peppa Pig series into mainland China in August 2015. It was subsequently shown on the online video platforms Youku and Aiqiyi. Within a year, the cartoon was screened more than 10 billion times. On Youku alone, Peppa Pig has garnered more than six million daily views. Without a doubt, Peppa Pig is a popular cartoon among kids. But in China, teenagers and young adults are her biggest fans. This is because they are not watching the original version of the show, but rather an ongoing series of “derivative works” featuring the animation from the Peppa Pig program, but with dubbing in different Chinese dialects, with different language. Drawn from an episode in which Peppa and Suzy Sheep get into an argument, the video is dubbed with adult language. The storyline instead has Peppa and Suzy competing for the attention of prospective boyfriends. Naturally, these derivatives can easily fall into the category of vulgar content, as defined by related state regulations for online content. But however naughty these videos might be, they have existed for years without facing a problem, making Douyin’s ban seem more of a reaction to state mouthpieces’ ideological critique of the Peppa Pig/Shehuiren crossover subculture, and the affiliated emergence of Peppa Pig products like stickers, watches, and mobile phone covers. 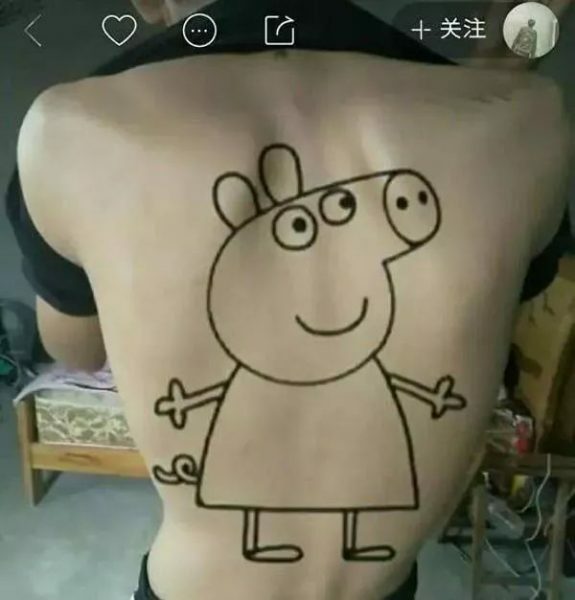 Peppa pig tattoo. Screen capture from viral video. Wear a Peppa pig tattoo, Shehuiren receives applause. Wear a Guan Yu tattoo, Shehuiren receives applause. Guan Yu is a historical figure worshiped by Chinese underground criminal society. Since the meme was attached to videos which reflected Shehuiren characteristics, the term has since evolved into the mockery of video platform users who don’t follow mainstream work ethics. Those who work in big cities often feel repressed and anxious. They may want to resist, but eventually they have to obey. The tension keeps mounting and they end up using Peppa Pig to express their aspiration of being a Shehuiren — a person who follows their heart regardless of social norms. 1. Peppa’s family is rich — they live in a villa. 2. Peppa is plastic — she is cheerful, confident, carefree and never has to worry about money. 3. Peppa’s mother is second generation rich — her parents live in a villa with a big garden and a yacht. Peppa’s mother knows how to play the violin and speaks French. Both the hooligan culture and the critique of social norms can be seen as subversive to China's vision of a Harmonious Society. This subculture also has a huge impact on the cultural economy. The Global Times  reported that on Taobao, China's largest e-commerce website, one online shop sold 30,000 Peppa Pig/Shehuiren tattoo stickers and 110,000 Peppa Pig-themed watches in just one month. The China-based distributor of Peppa Pig has seen its copyright revenue escalate, while the UK-based Entertainment One announced that the sales revenue  from product authorization in China achieved a growth of more than 700% in the first half of 2017 — and the Chinese market has kept right on expanding. However, Douyin's ban signals that the Chinese censorship authorities have the power to crush the cultural market if Peppa Pig or any other foreign-owned cartoon characters become too naughty.